when i was a wee little girl back in dublin, there was nothing i loved more for breakfast than this cereal. but, me mum would not buy it for us very often. with 10 kids, who could blame her!?! hahaha just kidding! about the dublin part. and the mum part...oh, and the ten kids part. but, i DID love this cereal. so i was thinking about it and i wondered if there were many recipes out there using this wonderful stuff. 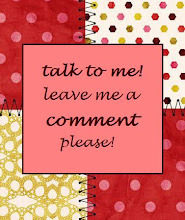 was i surprised when i found several yummy looking recipes and some not-so-yummy ones! 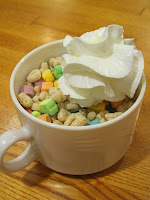 at ratty gourmet there is the simplest one that is basically lucky charms, milk and whipped cream. genius! betty crocker has a recipe using lucky charms in a raspberry smoothie. that sounds interesting. 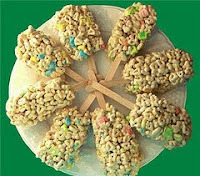 a great blog called two hearts together has lucky charms treat bars on a stick. call me crazy, but marshmallow treats you can eat without getting sticky are a winner to me! and over at cooks.com, they have a party mix using lucky charms, peanuts and raisins...simple but yummy. now, a not-so-yummy one was a recipe for some sort of balsamic dressing that utilizes lucky charms marshmallows. um, ew!!! 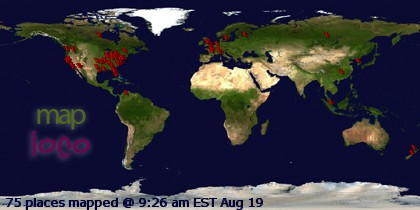 so, ok, get out there and use those lucky charms or just eat 'em by themselves. you'll be glad ya did! lots more whipped cream and no milk. along with a cup of coffee. Yummy!! !